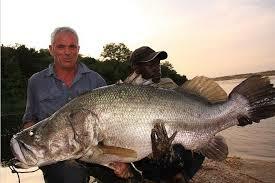 Top 10 Largest, Biggest Fresh Water Fish in the World. HomeAQUARIUMTop 10 Largest, Biggest Fresh Water Fish in the World. he beluga sturgeon in Russia is the largest freshwater fish in the world. This massive fish can reach over 15 feet long and weigh upwards of 2,500 pounds. The largest recorded beluga sturgeon was almost 20 feet long and over 7,000 pounds. These fish also have a long lifespan, living to 100 years and older. 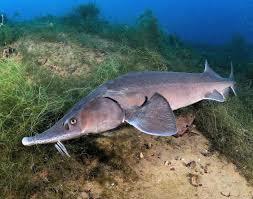 get them, leaving the beluga sturgeon endangered with little chance of survival. Beluga sturgeon eggs are the most prized and rare type of caviar, favored for the delicate skin, but due to the endangered status of the fish, beluga sturgeon caviar is illegal in the United States. The white surgeon is the biggest freshwater fish in North America. It can reach 20 feet long and weigh up to 1,500 pounds. 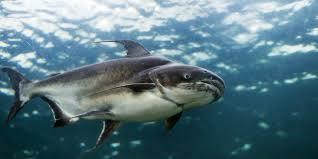 These large fish can live in fresh or salt water and can be found in the Western United States and Canada. 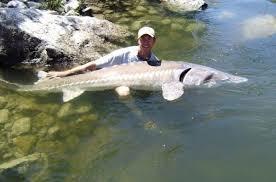 White sturgeons have been around since prehistoric times, but there existence on this Earth may soon end. There are only an estimated 500 of them left. 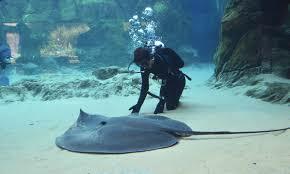 t the bottom of the rivers in Thailand, Malaysia and Borneo, giant freshwater stingrays rest. These bottom dwelling fish can reach 10 feet long and weigh up to 1,300 pounds, however, natives have claimed they've seen even bigger specimens of these fish. If you spot one of these giant stingrays, leave them alone. They have a giant venomous barb that is capable of penetrating your skin and bone, and they aren't afraid to use it when needed. Due to overfishing and habitat degradation, the giant freshwater stingray is endangered. 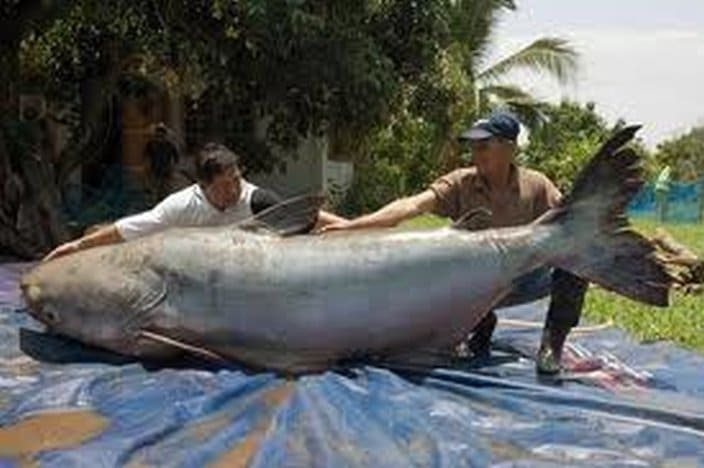 The Mekong giant catfish is huge. It can grow up to 10 feet long and weigh upwards of 600 pounds. Because these fish are so large and apparently quite tasty, they have been overfished and are endangered. Planned construction of a dam in the Mekong River also serves as a threat to this species survival. 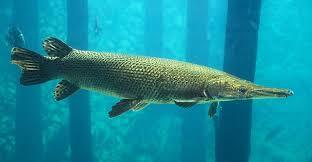 The alligator gar may resemble an alligator when you look at its mouth, but rest assured, it is a fish. This large freshwater fish has a long snout and two rows of fang-like teeth that make it look really scary. The fact that it can reach 10 feet long and 350 pounds makes it even scarier. But, there's no need to fear because there have been no reports of an alligator gar attacking a human. Arapaima live in the Amazon River basin of South America and can reach 8 feet long and 330 pounds. There isn't much oxygen in the waters that they live in, but they do okay because they are actually air breathers, meaning they go to the surface every 10 to 20 minutes for a breath of air. If you swimming in a river or lake and see a shark, you may not be seeing things. The bull shark can live in both salt and fresh water and can be found in bodies of fresh water that connect to the ocean. 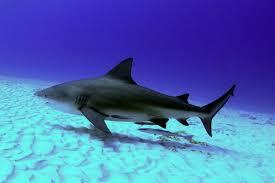 Bull sharks can be found in the Mississippi River all the way to St. Louis, the Amazon River and in Lake Nicaragua. These sharks can reach 11.5 feet long and can weigh over 500 pounds, and yes they do attack. There have been numerous reports of unprovoked attacks on humans by these freshwater lurking sharks. Taimen are trout that are found in Mongolia and Russia. These trout are huge. They can grow almost 7 feet long and weigh as much as 230 pounds; however, due to overfishing it's hard to find ones this big anymore. The Nile Perch can reach up to 6 feet long and can weigh up to 500 pounds. They are aggressive hunters that can be found in lakes, ponds, rivers and streams throughout the Ethiopian Region of Africa, the Mediterranean Region, the Nile Delta and in the Congo Basin. Paddlefish can grow up to 5 feet long and weigh up to 60 pounds. These fish got their name from their paddle shaped snouts, which they use to dig in the ground in search of vegetation to eat. Paddlefish are big, but gentle. They can be found in throughout the rivers in the Mississippi Valley and in Gulf slope drainages in North America.